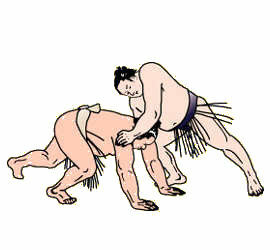 Tochinoshin dépose Daieisho hors du dohyo. Le sekiwake Tochinoshin a conservé son avance et un record parfait avec une victoire facile sur le maegashira 3 Daieisho ce lundi. Tochinoshin, qui pourrait être promu au rang d’ozeki, le second plus élevé du sumo s’il acquiers au moins 10 victoires, a encore une fois montré sa force pure dans une victoire unilatérale contre Daieisho (2-7) au Ryogoku Kokugikan de Tokyo. 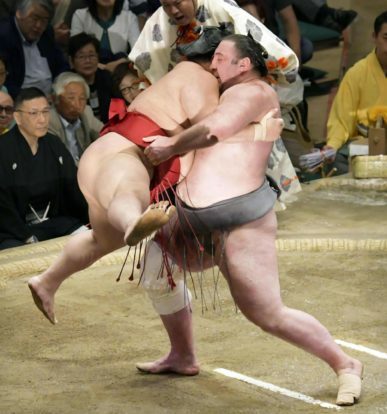 Le Géorgien a saisi la ceinture de son adversaire à deux mains, puis a soulevé le maegashira de 162 kilogrammes et l’a déposé hors du dohyo (cf photo). Tochinoshin, qui a remporté son premier championnat de division de makuuchi en janvier, a amélioré son record de carrière contre Daieisho à 3-1. Les yokozuna Kakuryu et Hakuho, avec le maegashira 11 Chiyonokuni, ont obtenu des victoires convaincantes et restent dans les pas du leader avec huit victoires chacun. Dans le dernier combat de la journée, Kakuryu, qui vise son premier gain de 2 championnats consécutifs, a battu Shodai (6-3) en quelques secondes. Hakuho, qui était absent du tournoi du mois de mars en raison d’une blessure, a battu le numéro 5 Kotoshogiku (6-3) et ne cumule qu’une seule défaite, il y a trois jours face à Abi. 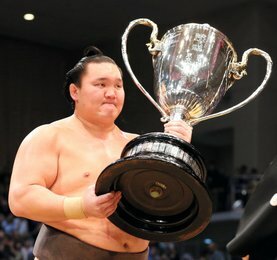 Le yokozuna mongol, lorgnant un 41ème titre de champion, a propulsé Kotoshogiku vers le bord. Après que son adversaire l’ai fait reculé de quelques pas, le grand champion a exécuté une rotation du torse pour contenir la charge et faire tomber son adversaire. Hakuho affrontera le komusubi Endo (3-4-2) demain. Le favori des fans, Endo, fera son retour sur le ring après s’être retiré suite à une blessure à la main droite samedi. Chiyonokuni (8-1) a obtenu un record de victoires après avoir battu le No. 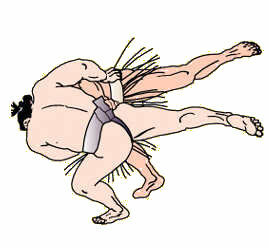 14 Takekaze (4-5). Chiyonokuni a pris le contrôle en frappant le visage de son adversaire avec sa main gauche tout en poussant la poitrine de Takekaze avec sa main droite, forçant Takekaze à sauter hors du ring. Le sekiwake Ichinojo (5-4) a battu l’ozeki Goeido (3-6) qui s’est retiré de la rencontre plus tôt dans la journée avec des problèmes à la cheville gauche. Goeido rejoint ses l’ozeki Takayasu et le yokozuna Kisenosato sur la liste des victimes. C’est la première fois que deux ozeki se sont retirés d’un tournoi depuis que les tournois durent 15 jours , soit depuis 1949. 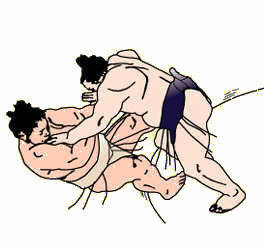 Sekiwake Tochinoshin retained his lead and a perfect record with an easy victory over No. 3 maegashira Daieisho on Monday, the ninth day of the 15-day Summer Grand Sumo Tournament. Tochinoshin, who could be promoted to sumo’s second-highest rank of ozeki with 10 wins here, once again showcased his brute strength in a one-sided win against Daieisho (2-7) at Tokyo’s Ryogoku Kokugikan. 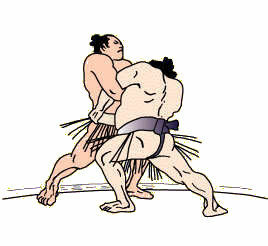 The Georgian grabbed onto his opponent’s belt with both hands, lifted the 162-kilogram maegashira clear off his feet and pushed him out of the ring. Tochinoshin, who won his first makuuchi division championship in January, improved his career record against Daieisho to 3-1. Yokozuna Kakuryu and Hakuho, along with No. 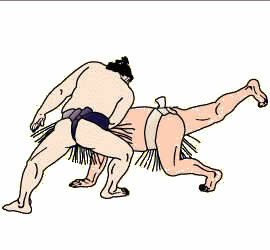 11 maegashira Chiyonokuni, had convincing wins and remain one back of the sekiwake with eight victories each. 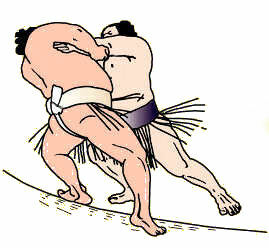 In the day’s final bout, Kakuryu, who is aiming for his first back-to-back championship, defeated Shodai (6-3) in seconds after steamrolling the No. 4 maegashira straight from the ring. 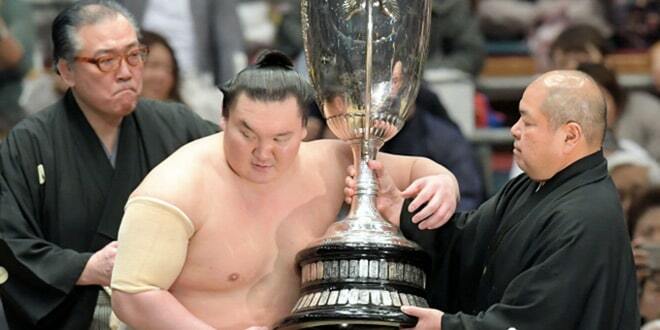 Hakuho, who missed the March tourney due to injury, took down No. 5 Kotoshogiku (6-3) and improved to 8-1 since suffering a shock defeat three days ago to No. 2 Abi. 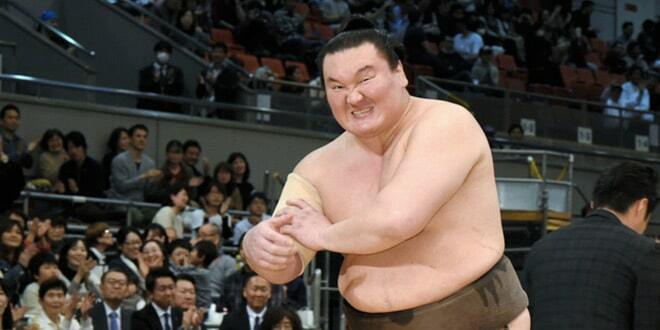 The Mongolian yokozuna, eyeing his 41st championship title, bulldozed Kotoshogiku toward the edge. 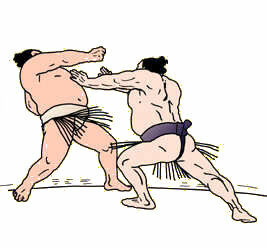 After his opponent gained a few feet back, the grand champion executed a textbook overarm throw to stay in contention. Hakuho will wrestle komusubi Endo (3-4-2) in Tuesday’s final bout. The fan-favorite Endo will make his return to the raised ring after pulling out due to a right-arm injury on Saturday. Chiyonokuni (8-1) secured a winning record at the meet after beating No. 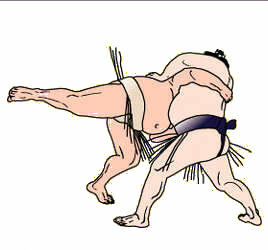 14 Takekaze (4-5). 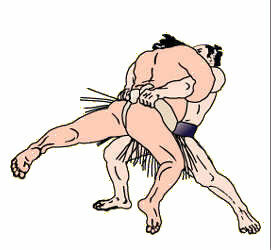 Chiyonokuni took control by slapping his opponent’s face with his left hand while pushing Takekaze’s chest with his right, forcing Takekaze to hop out of the ring. The 27-year-old Chiyonokuni posted his first winning record since September 2017, when he fought as the No. 7 maegashira. Sekiwake Ichinojo (5-4) snapped his four-match losing streak with a default win over ozeki Goeido (3-6), who pulled out from the meet earlier in the day with left-ankle trouble. Goeido joins fellow ozeki Takayasu and yokozuna Kisenosato on the casualty list here. 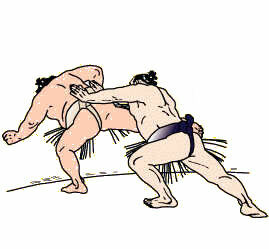 It is the first time two ozeki have withdrawn from a tournament since the sport went to 15-day meets in 1949. 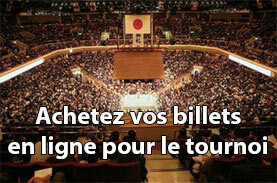 Suivant J10 – Tochinoshin virtuellement ozeki !